Chris Hoskins is a dedicated singer, songwriter and writer. She is the winner of several poetry competitions, short listed for the Poet Laureate post for BBC Coventry and Warwickshire, Short Listed for the Leeds Peace Poetry prize and her poems are published in numerous literary magazines and anthologies. She has been commissioned to write and funded to run Poetry Workshops by Poetry–on-Loan. Her songs and arrangements of her own songs have been published in two publications as well as performed by other choirs. One of her stories was used along with others to stage a play in the West End! She has also written, performed and recorded a series of Monologues ‘relatively speaking’. Further information about these is below. Chris’s love for singing began in early childhood and harmony singing seems to have been something she’s done ever since she can remember. Chris says; “My sister Elaine and I used to sing at the local chapel in Wales where we were brought up. It was a fantastic nurturing experience to sing with the rich voices of the chapel choir and for Elaine and I to sing duets at local Eisteddfods and other events.At Eisteddfods, the judges comments were always amusing and encouraging so we certainly had plenty of encouragement and performing opportunities from a tender age. On Sunday mornings when the choir had gone home and the chapel was still and quiet, I’d sit at the huge organ, pedalling away and playing for hours, picking out the tunes of the hymns we’d sung that morning. What a treat! Little wonder that these wonderful childhood experiences influenced my future singing and writing career and my desire to share these. Chris keeps her own singing voice and skills regularly updated by attending workshops and working with other professionals. As a trained nurse, counsellor and teacher she is perfectly placed to teach groups about the anatomy and physiology of the voice, body and breathing and to teach, inspire and support others with empathy and understanding. 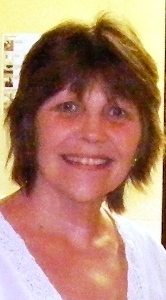 She is a member of the Natural Voice Network and is the founder of One Voice choir. You can find out more about Chris’s work on the relavant pages of this site.